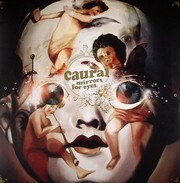 Mirrors For Eyes is Caural's second release for Mush & the proper follow up to 2002's acclaimed full-length effort, Stars on My Ceiling. With intricate sound splices, daring drum programming, and surprises waiting behind every beat, Caural pushes the fine art of headphone music into the future. Guests include Hrishikesh Hirway (One AM Radio), Paul Amitai, and Racecar (Modill). Extensive touring throughout 2006 with Busdriver.